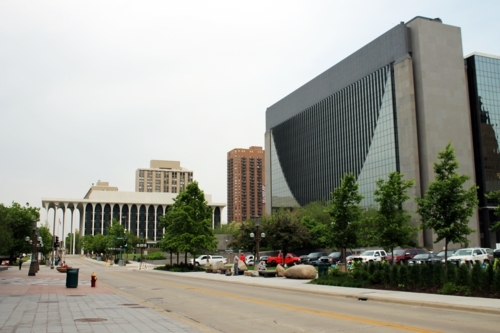 Last year, I went to Minneapolis for the first time, and I loved it. 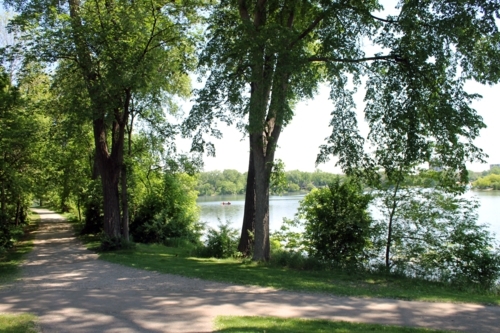 I was impressed by how well designed the city is in terms of transit, by the great food choices, and by the general beauty of a city on a river and multitudes of lakes. The atmosphere is lovely, friendly, and very appealing in May, though I’m sure I’d be singing a different tune in the winter months. 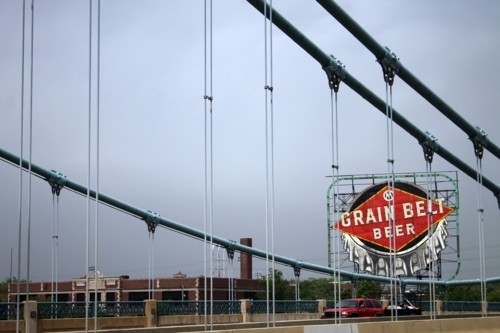 This year, my husband was speaking at CF Objective, the same conference he was working last year, and I jumped at the chance to explore Minneapolis some more. 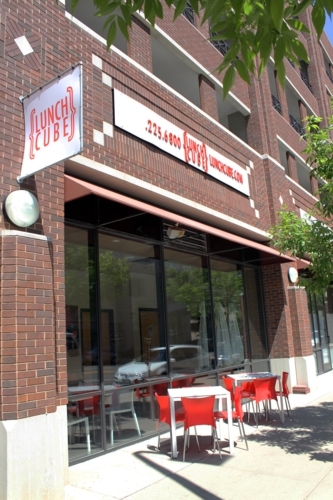 For our first lunch, we went to the Lunch Cube (1122 Harmon Place), a nondescript sandwich shop with a cute pun to describe their sandwiches. If you order a box to go, you do, indeed, get a cube. 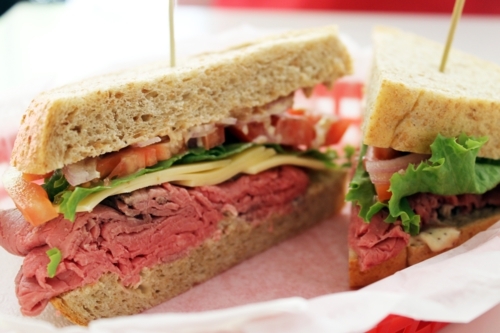 On Yelp, I discovered a lot of love for a sandwich called the Chairmen, and I’m one of those people who just have to try out what’s recommended. 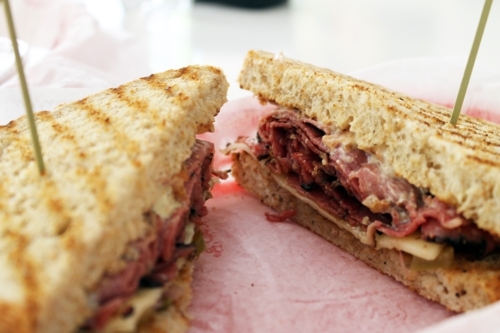 It’s made with grilled pastrami, provolone, smoked tomato aioli, and jalapeno relish. Those Yelpers were right. I’m not a pastrami fan in general, but this was so good that I ended up convincing my friend to let me have half, as she was eyeing my BLT Panini anyhow. I had thought I’d be satisfied with a bite, but I was wrong! The pastrami was thickly cut and had great flavor. The tomato aioli and jalapeno relish mixed together to create a sweet, tangy sauce. If it had some lettuce as well, it would have been fabulous. Now back to that BLT Panini. 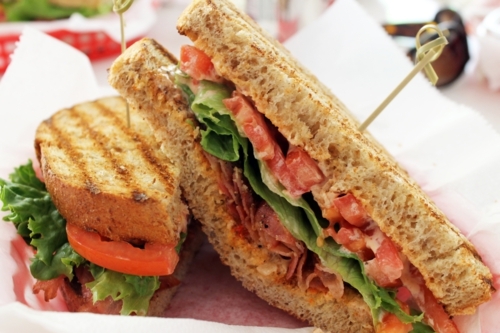 This sandwich was made with smoked pepper bacon and roasted red pepper mayonnaise. As you can tell, paninis at the Lunch Cube mean that the bread is lightly toasted — these aren’t really pressed sandwiches. The pepper on the bacon was great, but the bacon was very thinly sliced and fairly sweet, especially with the red pepper from the mayonnaise. I probably wouldn’t order that one again. I added a side of their pasta salad, having read good things about it as well. 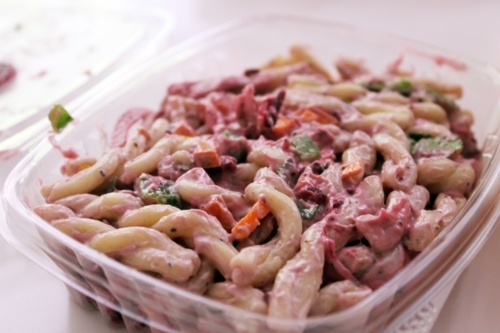 It’s a unique take on pasta salad, heavy on the mayonnaise but also mixed up with a red wine vinaigrette. The result is clumpy bites that taste tangy and combine nicely with the crisper veggies: green bell pepper and chunks of kalamata olives so tiny that I couldn’t even complain when one made it in my mouth. The crisp parsley was the star of the pasta salad. If you like your sides extra creamy, you may like it. My husband had the Executive, made with roast beef, smoked tomato aioli, and Gouda. He thought it was good. After lunch, it was time to cross one of the must-sees off my list: the Chain of Lakes. 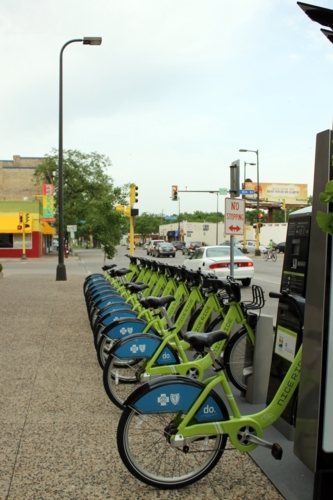 We priced bike rentals and decided that the Nice Ride bikes were our best option, even though they aren’t designed for recreational use but for quick jaunts around town (definitely worth looking into if you’d rather bike than walk!). Ben loves biking, but this was my first time since high school, and I was tired in record time. I can walk for days, but biking kicks my booty, even when the majority of the path is flat like the Cedar Lake and Kenilworth trails we used from downtown. 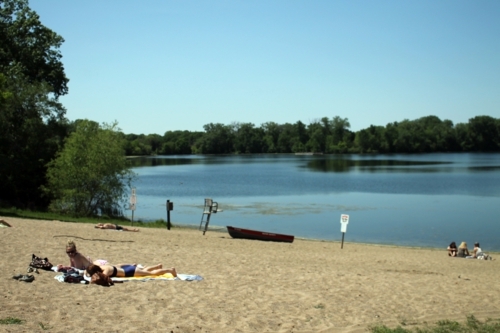 The lakes we rode around were Cedar Lake and Lake Calhoun, and I’ve got to tell you all, the beach scene cracked me up. As a Californian, I just don’t think of a lakefront as a place to lay out and soak up sun unless you’re on a boat. But those Minnesotans were obviously happy to do just that! I imagine I’d get over my snobbery in record time if I lived there, too. I may scoff, but it’s a gorgeous area. Click on the panorama for a better view! Dinner that night was back downtown and at Hell’s Kitchen (80 9th Street), a restaurant renowned for its inventive takes on classic American food. “Damn good food” is their slogan. There are pages of options including breakfast all day, pastas, bison burgers, and grilled entrees. The atmosphere of the restaurant is perfect for me. Let’s call it whimsical goth. 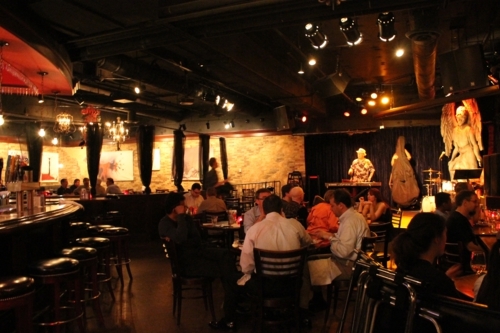 A talented jazz band played throughout our meal, adding to the ambience. Having realized at 7 at night that I had no caffeine all day, I decided to try their Darwin’s Martini, because alcohol and coffee together is always a good idea. Made with a shot of espresso, cinnamon-infused vodka, Tia Maria, Frangelico, and a few other coffee-enlivening liquors I can’t remember, the martini was quite delicious. 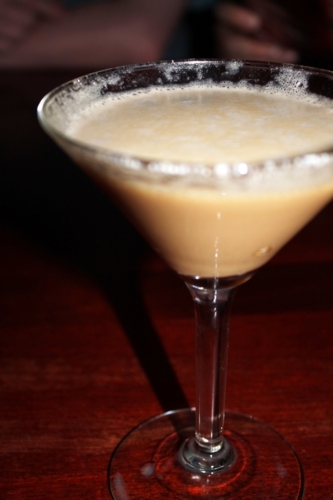 The waitress warned me that it might be too sweet, but I disagreed because the quality espresso broke right through all those sweet liquors, achieving the bitter/sweet balance I love in a good coffee martini. Well done. For food, breakfast called to me the most. Lemon ricotta hotcakes with a side of sausage bread sounded like a wonderful meal. I wasn’t wrong. The sausage bread, made with bison sausage, black walnuts, coffee, spices, and black currants, was divine. 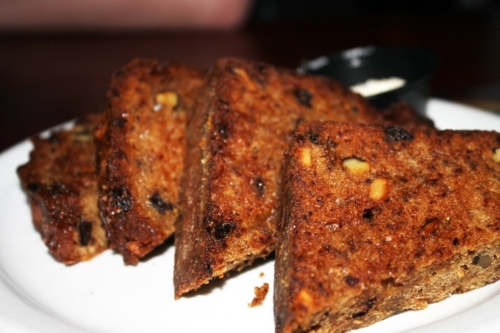 It was the texture of zucchini bread and the taste of bread pudding in bread form, as one of my companions described it. The sausage’s main contribution was adding a meaty, earthy flavor to the bread, and everything else tasted awesome together. Also awesome was the assortment of toppings served with it and my hotcakes. There was an orange-ginger marmalade (heavy on the ginger), a fruit jelly (blueberry I believe, which is probably why I didn’t like it), and the amazing honey-roasted peanut butter. 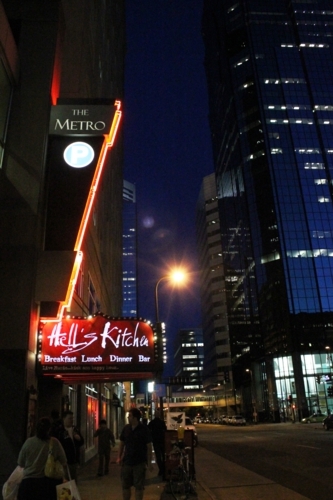 My word, y’all, that peanut butter with its intoxicating mix of sweet and salty, is reason enough to try Hell’s Kitchen. My hotcakes were also fantastic — sorry, no pic! They were fluffy and moist from that ricotta and lemon combination. No toppings of any type are needed to enjoy them, though try to stop yourself from using that peanut butter. I dare you. 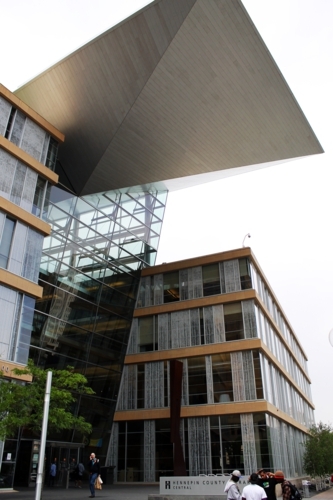 On Thursday morning, I crossed “Explore the skyways” off my list. 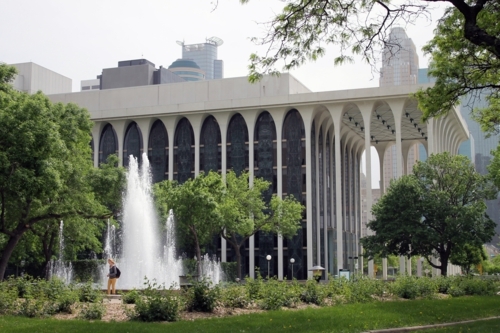 Minneapolis is smart, you see, because they have 8 miles of passages in between their buildings, making travelling between them in the winter much more pleasant. Make sure you explore on a weekday, though, because they all have different times that they close down at night, so you can end up lost between buildings with no way through but out! Double decker skyways as seen from another one. Inside one of the skyways. 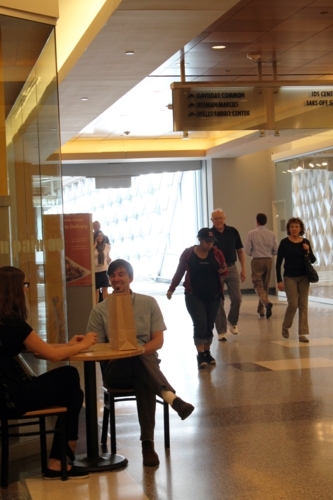 The skyways are home to a multitude of shops and quick eat spots that you wouldn’t know were there from the street level. 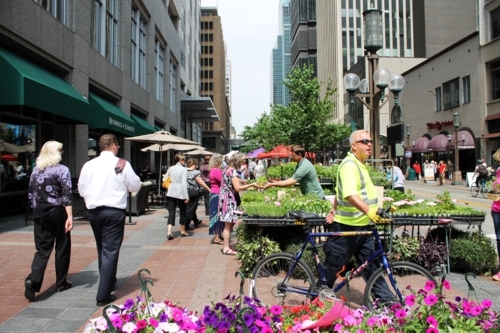 The street level, where a farmer's market is held every Thursday on the Nicollet Mall. 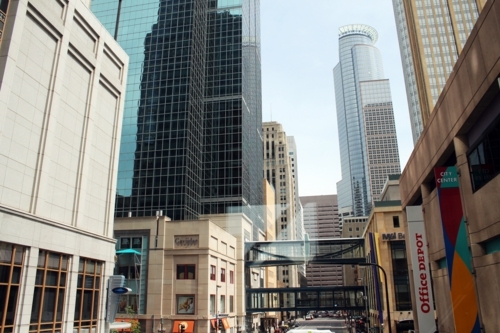 Walking through them feels exactly like making your way through a huge mall with food courts all around — the humor that Minneapolis is also home to the Mall of America was not lost on me. 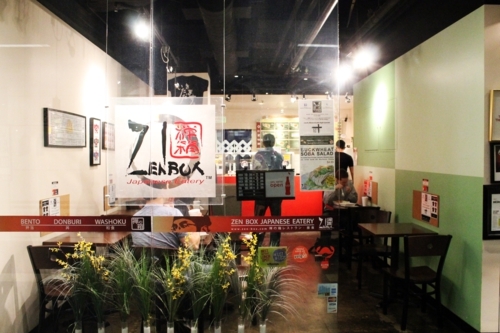 I looked up some of the best skyway eateries and dragged Ben along to one of them, the Zen Box in the 6 Quebec building. Their menu is limited to bento boxes and rice bowls with five options for each. 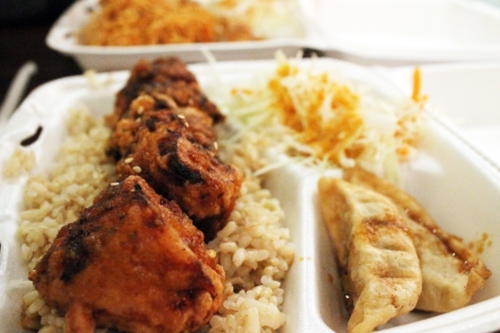 We shared two bento boxes, one with yaki soba and one with chicken kara-age. I’m still trying to figure out what sauce the soba used. It reminded me a lot of tamarind’s sweet and bitter tang, but I don’t know that it was tamarind-based. Brown sugar is also a likely suspect, but whatever the ingredients, it was a new sauce to me. The noodles were cooked al dente, which is impressive for a food court type of eatery, but I’m not sure I’d recommend it. The kamikaze sauce on those fried chicken squares was delicious, however, and there was a lot of chicken hidden inside them. 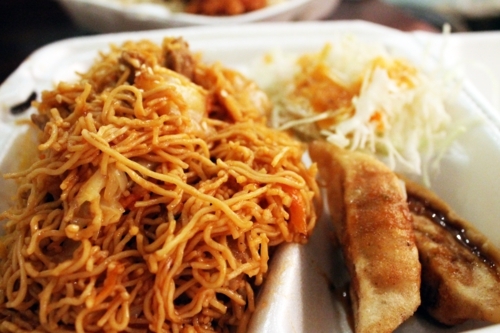 The side salad was shredded cabbage with typical ginger dressing, and the two gyoza were good, but not noteworthy. Ben liked it a lot; I think I would try many more skyway eateries before heading back again. 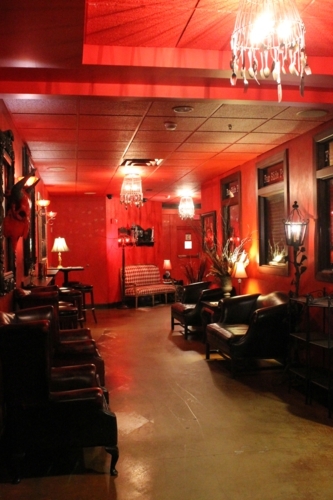 However, it is a much more affordable option than the street level restaurants downtown, as were all the skyway eateries. Look to the second floors of buildings if you want something fast and cheap. Heading across the Mississippi to the Northeast neighborhood was my plan for the rest of the afternoon. 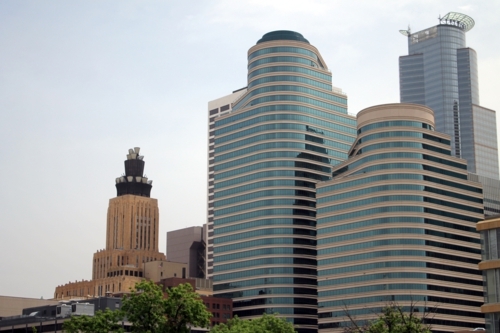 I took a few more pictures of downtown while strolling to the end of the Nicollet Mall and crossing over to Hennepin Avenue. As always, I took far more pictures than I’ve shared with you. Swing by the album to view them all. Next time, we’ll cross that bridge into Northeast together.